What's Really Going On This Year On Doctor Who? Steven Moffat doesn't bother waiting until the penultimate episode the season to start unpacking the mysteries of Doctor Who — episode six, "Flesh And Stone," is full of huge twists and revelations. But what do they mean? Spoilers ahead. So at this point, U.K. viewers have had the advantage of seeing a couple more episodes of Doctor Who season five, but it still seems like the major turning point of the season and the biggest source of clues is "Flesh And Stone." So worry not — if you haven't seen "Vampires Of Venice" or "Amy's Choice," you won't be spoiled here. The biggest mystery of the season, of course, is the crack in the universe which seems to be following the Doctor and Amy around on their travels. It started as the crack in Amy's wall when she was a little girl, and it seemed to be the means by which Prisoner Zero was able to escape from his Atraxi jailers. And ever since then, in every episode, it's appeared in a wall or a bulkhead or someplace. It was starting to look as though the Crack would be this year's "Bad Wolf," turning up in the backdrop of every episode before being explained in episode 12 or 13 — but why wait? We get an explanation early. Hooray! So. The Crack is indeed a crack in time. The Doctor opens it wider in "The Eleventh Hour" using his sonic screwdriver, and he assumes it'll just close and seal itself permanently. But instead it keeps growing and manifesting in more places. The Weeping Angels think they can use it as a power source, much like the radiation from the crashed ship Byzantium — but they're wrong. (And you have to wonder if the Angels arranged for the Doctor and Amy to be there, since the Crack seems to be following them.) Once the Crack opens wide enough, a blinding light starts spilling out — and anyone who goes near it gets erased from history, so that he or she never existed. And now it will require a complicated space-time event to enter the Crack, thus erasing itself and closing the Crack temporarily — the Doctor would do the trick, but it turns out so would the Weeping Angels themselves. (And yes, this is an awfully convenient solution to the story's main problem.) We discover that the Crack is caused by some kind of explosion — and the day it happens appears to be Amy's wedding date, the day after the Doctor took Amy away in the TARDIS. Does something terrible happen on that day? And does it have something to do with the opening of the Pandorica? We first heard about the Pandorica back in "The Eleventh Hour," when the soon-to-be-executed Prisoner Zero warns that the Pandorica will open and silence will fall. And now we hear about it again, when River Song says that one of the adventures they will soon share will be the opening of the Pandorica. The Doctor reacts this time around, saying the Pandorica is just a fairy story, but apparently it isn't. As for "silence," fan speculation has it that's a reference to River Song herself, since her first episode was called "Silence In The Library" — but more likely, silence is just silence. We also learn that River Song killed someone in her past and the Doctor's future — a hero to many, and the greatest man she's ever known. It certainly sounds like this refers to the Doctor, especially given the way the Doctor says "Time can be rewritten" after he hears this news. But maybe it's a red herring? If this means a real death, not just a "regeneration" death, presumably this happens way, way later — since River sounds like she's met other Doctors after the Eleventh Doctor, and they've had loads of adventures together by the time "Flesh And Stone" happens. If that's the case, we won't get to see this storyline play out at the end of this season, but maybe I'm misinterpreting? So Amy is possibly the most important person in the universe, for reasons having to do with the crack in time. And it's already becoming apparent there's more going on with her than we're realizing — including the mystery of the Two Doctors. 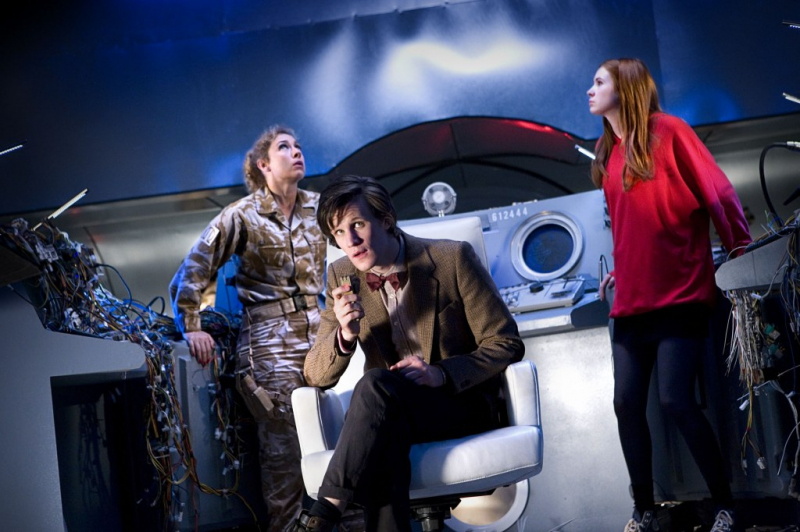 So you might have noticed that when Amy is in the forest, waiting with the cleric redshirts, the Doctor and River leave to go to the flight deck. But then the Doctor reappears a moment later, to have a private chat with Amy — and this time he's suddenly wearing his jacket, which he lost earlier and doesn't have the next time we see him. And he's very keen that Amy trust him, and that she remember what he told her when she was seven. So what did the Doctor tell Amy when she was seven? We have to assume it wasn't something about fish custard. There's rampant speculation that this jacket-wearing Doctor is from the future, and he also pays a visit to Young Amy, around the time she's waiting for him to return at the start of "The Eleventh Hour." When Young Amy is waiting for the Doctor to show up, we see a shadow pass her window, and it could be the future Doctor arriving. Also, Amy has a dream of her younger self waiting for the Doctor to return, and he does — but is this a dream, or a suppressed memory? Why are there no ducks in the duck pond at Leadworth? Did something scare the ducks away? Were they eaten by the Crack? Is there a third floor in Amy's house? There appears to be a staircase leading up from the second floor, but we never see what's up there. What happened to Amy's Aunt? We never see her. Why doesn't Amy remember the Daleks invading Earth? And why does nobody remember the Cyber-King striding across Victorian London? Is this an alternate universe? Has time been rewritten? Is there a perception filter? In "The Eleventh Hour," the Doctor nearly crashes into Big Ben and it's 9:15 PM. And when he arrives in Amy's garden, it's 8:30. Did he travel back in time slightly? Or sideways? Also, Amy seems to fiddle with some controls when she first enters the TARDIS in "The Eleventh Hour." And the Doctor turns off the screen when she comes in, apparently so Amy won't see the crack being displayed. The first few seconds of "The Eleventh Hour" - that is, between 0:00:00 and 0:00:05 — struck me as weird. It's quick pan across the Earth-Moon system and then quickly dives into the Doctor flying over London hanging from his box. What struck me as odd was the tilt of the Earth. I didn't get it at the time, because I thought it was just a creative angle, coming in with a sort of "downward" angle and arcing like we're watching a plane fly from New York to London. But something struck me as odd about the orientation. Either they're taking artistic license with the proximity, size, and appearance of the moon to get a nice shot, or the Earth-Moon system is seriously off axis. What we see on the moon doesn't look like the near side or the far side of the moon. Either the moon is in half-moon position and we should see "lakes" on the left and craters on the right, or it's somewhere approaching aphelion, and it should look a lot like our moon. It doesn't. That makes this whole thing sketchy. We're diving in on the earth from a weird perspective. If we've just come off the lunar orbital plane, then the Earth is wildly tilted. Florida is south of Texas. The East Coast is east of Florida. Mexico is NNW of Florida. Washington State and Florida are in the same time zone. When we dive into London, we do so by flying due east and dive into the equator. There are no glaciers in northern Canada. It might just be a CGI mixup, but it gave me a sense of vertigo that had nothing to do with the camera work. My theory is that if the Earth-Moon system was set up as intended, then the Doctor is in some sort of either alternate or highly altered universe, where Earth's rotational axis is different, or the moon itself is different. That's not our moon. So either it's another universe, or time is being re-written somehow. And yet, "Victory Of The Daleks" clearly seems to take place in "our" universe. Winston Churchill knows the Doctor from previous encounters, and so do the Daleks. And the Daleks are clearly the altered ones from the Russell T. Davies timeline, with the mongrel DNA and the modified casings and so on. So let's summarize: There's a crack in time, and history is being rewritten or forgotten, and somehow it revolves around Amy and her strange house and her weird picture-postcard town, where the duck pond has no ducks. The whole mess culminates on Amy's wedding day, and I'm just guessing we're going to see that event around the same time that the Pandorica opens — around the end of the season. Does the Pandorica cause the explosion in space/time? Is the Doctor traveling back through his own timeline, braving the Blinovitch Limitation Effect, to "sort Amy out" before it's too late? I guess we'll find out in a month and a half. Generally, if you could get past the slightly convenient solution to the two huge problems the Doctor faced this time around, "Flesh And Stone" was a fantastic, mind-boggling episode. River Song continues to be intriguing and stylish, and I'm liking her more and more. It would be nice if River had some mysteries that didn't revolve around her relationship with the Doctor, but the character is fantastically well written and Alex Kingston is making an indelible impression. Iain Glen is absolutely brilliant as Father Octavian, especially the "You know me at my best" line, which is easily a top candidate for the best final words any character ever got to say. Poor Amy — she's stuck counting down to her own death, and she nearly snuffs it, and then she's stuck for half the episode with her eyes shut as terrifying things are happening all around her. And THEN she has to walk through the artificial forest with her eyes shut, pretending she can see. !!! The Weeping Angels are at their most menacing and terrifying this time around — and yet, I'm going to have to say I hope this is the last we see of them. They were amazing as a one-off villain in "Blink," and I wasn't sure if Moffat could make them work a second time. He clearly does, but he also exposes many of their limitations in the process. They can't really communicate, unless they do something gimmicky like stealing Sacred Bob's voice. And their central idea — that they move like lightning when you can't see them — runs into some severe limitations in this episode. There are several moments when nobody is looking at them, and they don't seem to get up to much. (In the flight deck scene where they've got the Doctor's jacket, he's not looking at them, and they should be able to wipe him out.) Also, perversely, trying to add to the Angels' power means that they need to have more limitations — now they can come out of video screens and take people over via their eyes, but on the other hand, they can't tell if you're really looking at them, or just pretending. I think the Weeping Angels were fantastic in this episode, even better than they were in "Blink" — but I also think that this might have to be their swansong, since the more we see of them and learn about them, the less they're going to work. But Moffat's already done the impossible many times, so who knows? What did you think of "Flesh And Stone"? And what do you think is going on this season?